My Jimmy Jib kits are supplied with lens control for Canon or Fuji broadcast lenses and most prime or zoom cinema lenses. 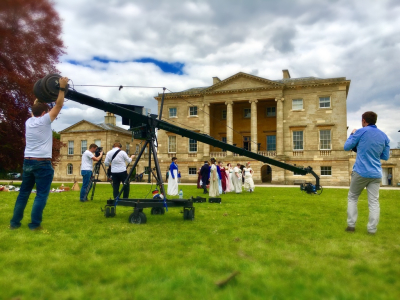 We can mount just about any camera to the crane ranging from the Canon C300 to an Arri Alexa or Sony PMW-F55. 3D camera rigs can also be mounted to the Jimmy Jib, as can high speed cameras such as the Phantom or Arri Hi-Motion. My Jimmy Jib kits come complete with Sony or Transvideo HD monitors and a 4 or 3 wheel base or track. Kits can also be supplied with a variety of accessories and add-ons including prompt kits, dutch roll kit, a Gator for quick relocation, a Ford Ranger tracking vehicle, wireless remote follow focus and a whole host of cameras and lenses. Health and Safety is of great importance when it comes to camera cranes and we take it very seriously. Both of my Jimmy Jib cranes are regularly tested and inspected and are maintained to the highest standard. They conform to the latest LOLER regulations regarding lightweight camera cranes.